I'm glad to hear that the site updates are underway, and looking forward to seeing the banner illustrations for the rarely-illustrated tales. I can't wait to see the new illustrations but I'll miss the current ones. 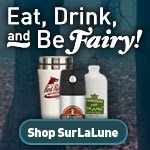 Will the new SurLaLune titles be available in eBook format? Good luck with the redesign! And thank you for all your work on this site! Is the redesign still coming along? I hope so, as I love the work you have done these last 20 years and hope it continues!